Top floor traditional flat located right in the heart of Edinburgh, on the iconic Rose Street. 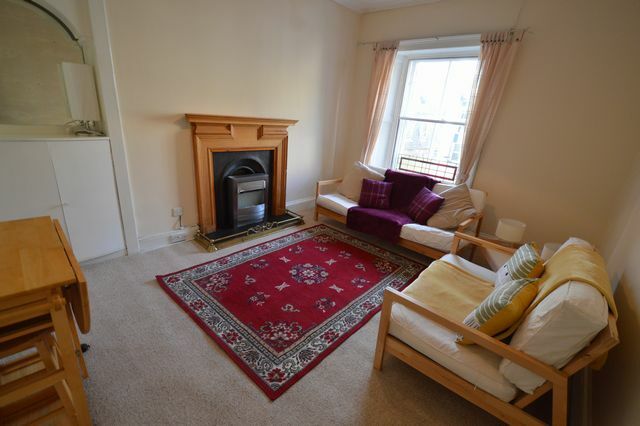 The property consists of a large front facing living room, with new neutral carpets and fresh magnolia paintwork. The room has been furnished to a good standard, with cream sofas and a fold away dining table. The kitchen has a selection of white units, with new fridge and washing machine and a large window to the side allowing for lots of natural light. There are 2 very good size double bedrooms, each with great storage. Both rooms has new carpets and fresh paintwork. There is a good size shower room with toilet and basin. The property benefits from GCH and secondary glazing. There is a secure door entry and permit parking. Rose Street is a fantastic street with great restaurants and bars and all city centre shops on your doorstep. The property is lovely and quiet and unusually bright due to its location on the street. A great property for professionals in the city centre. Landlord Reg: Awaiting. EPC: Pending.